The exhibition “Permanences and Destructions” occupied abandoned or disused places around Rio de Janeiro during the month of January. 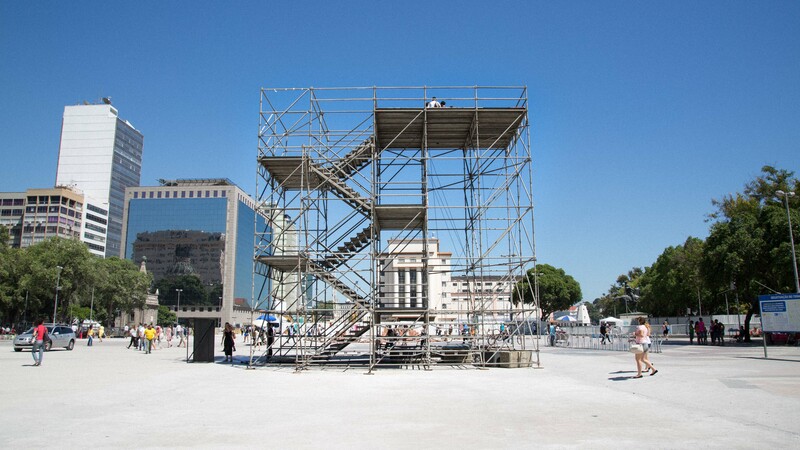 Starting January 9 at one of the main squares of the city, Julio Parente and Pedro Varella erected a ten-meter scaffold to evoke the memory of a recently demolished bridge. 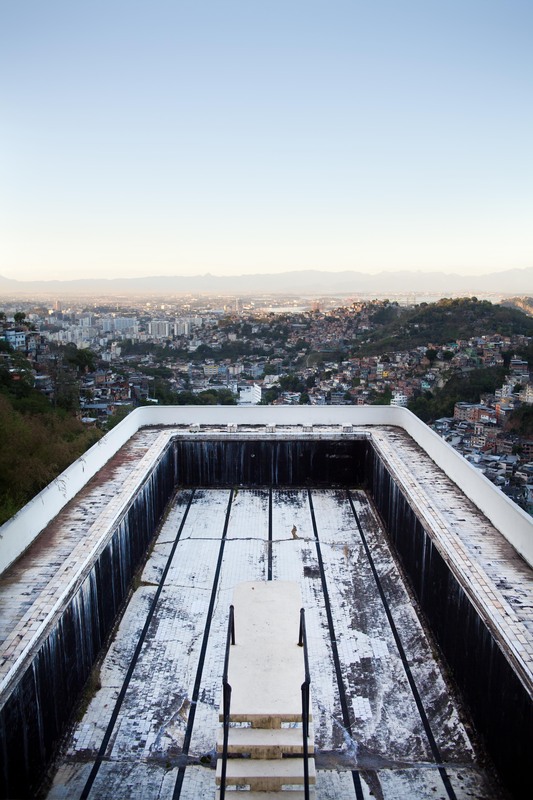 The exhibition ended with a sound intervention in an emptied Olympic pool, called “God Devil Man” by Pontogor, with the amazing skyline of the Santa Teresa neighborhood in the background. Curator João Paulo Quintella selected five sites for the installations, including the 1950s pool, an abandoned factory from 1938, a square where you see the remains of a demolished bridge, a building where a hotel once existed and, finally, a stockroom of old things on top of a flower shop. The artists were invited to create site-specific works for the project and the art ranged from performances to interventions in the buildings and sound installations. The project stimulated discussion about relations of use and abandonment, in a city with high commercial turnover, with more poetic discussions of time—that “invisible chemical”—in the words of Brazilian writer Machado de Assis. The exhibition recalled ideas promoted by the philosopher Martin Heidegger in 1950, in his essay “The Origin of the Work of Art,” that a ruin of a world is irreversible. The philosopher did not refer only to the destruction of a physical space, but above all, a set of practices and discourses that, given the history, would be permanently altered with no chance of redemption. The ruin would then be sign of what was once, but never again will replace. In a world that lives in a planned obsolescence and anxioulsy begs for ‘the new,’ it is essential to reflect on what remains, on what once was and, unavoidably, is no more.